ऑब्जेक्शन मी लॉर्ड: "I am deeply in awe of all Indian literature"
She is an eminent writer in English with five novels and three non-fiction books to her name. Recently, Namita Gokhale spoke to Nirmala Bhuradia about her own creative process, the literary scene in India and her efforts to bring the writing fraternity together. 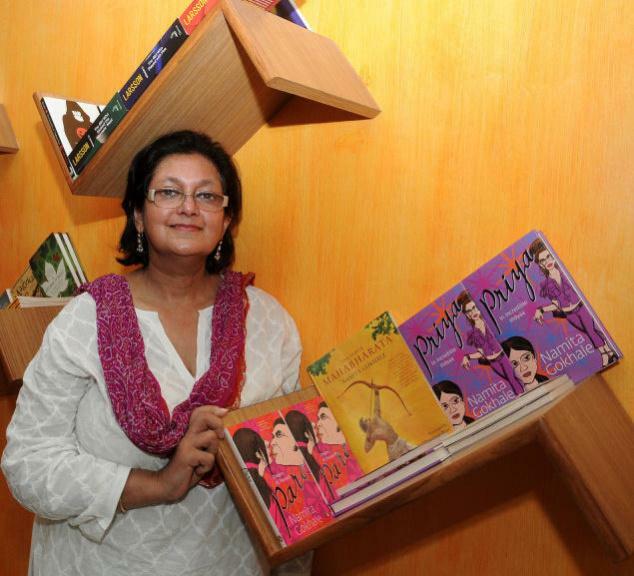 She is one of the pioneers in conceptualizing literary festivals in India for this purpose. * At what age did you start writing? Can you recall your first written piece? - Yes. Another person may have looked at it as a very commercial or vulgar moment in Indian publishing. But for any student of Linguistics or even Literature, it was a very liberating moment when language broke out of its colonial straightjacket and we could speak the English we knew, wanted or mixed together. It was a Bhel-Puri English. * Here comes the question of Indian English, which I can see in your literature also. Well, where do the characters of your novels come from? * How long do you carry a story idea within you? - The time steals me! It just happens. I do end up writing and those are the moments for which I actually live and which sustain me and keep me a creative person. I've got a new novel coming out end of this year. It's not a novel; it's a collection of short stories. I have no idea when I wrote them...! * Do you collect and keep notes? - No. I work in the most unprofessional way. * Do you ever face a writer's block? - Yeah of course! Regularly. There are times when I can't write. * Then how do you fight it? - I do other things. I don't call it a writer's block. I think there is a time when an idea is maturing inside you. At that time I don't write. Whatever I do write comes out stilted or predictable but to have that "connection" it needs that moment. * When you are a writer at work do you ever discuss your idea with anybody or do you keep it close to your chest? - I used to discuss all my ideas with everybody. Then I realized that's the worst thing a writer can do because when you discuss your ideas, you really dissipate the energy. All the ideas I've discussed a lot, I've never done. So now I have become extremely careful not to discuss. I may discuss any number of ideas which I may never use or which are not important to me but the one I am working on, I don't discuss. - Well no, everybody would treat an idea differently, so I am not worried about that. It's just that I would lose the urgency of telling it. * How many drafts do you actually write? - The first draft is usually by hand. Then sometimes I type it out myself and sometimes I get my secretary to type it out. If my secretary has typed it out, she makes so many mistakes that it becomes a second edit very nicely after I think it through. Even if I type it myself, it is a second edit. * Do you always keep your readers in your mind when you write or do you just forget about them? - I forget about them. I don't know if that is a good thing or a bad thing, I write only for myself, nobody else. * Under which ideal circumstances are you able to write best? - Actually, looking back, I think I write best when I am in the hills in Nainital. My mind is most balanced and at peace when I am in the mountains. But it won't happen for at least another few years. I'm just so caught up with things here. So that's an ideal but not a usual thing. * You are a pioneer of literary festivals in India. Others are now following your trend. How did this concept first occur to you? - Oh, it just happened by accident. I used to hold writer's retreats in Landour. I did the first Neemrana literature festival in 2002. That was because although I write in English, I am deeply in awe of all Indian literature. I think the best writing in India is happening in the Indian languages. I felt that if English language and the Indian language writers could connect, they would all benefit from it. So everything I have done on the literary scene has only been for the purpose of bringing the mainstream English writers who are more market oriented and writers of the Indian languages together and to connect them in different ways. That's why I do these festivals. I don't know why other people do that but I feel the more festivals, the better because they make books and writers visible and create a literary community. So good luck to anybody who does a literary festival. * So you don't have any fixed format for the festival? - I help out with all new festivals. We used to do this Doon festival in Dehradoon. I've helped out with the Bhutan Literature festival; I've helped out with the Hey festival a little bit in Kerala. I've just done a beautiful festival in Kathmandu called the Kathmandu literary Jatra. We tried to go to Kashmir but it didn't work out. We did a lovely set of readings in Kota, Rajasthan. I help out wherever I can. There are always other people working on it as well. We try to make everything rooted and local. If something has roots, then it can grow strong. * Do you read works in Hindi, Marathi or any other Indian language? - Hindi, yes. Marathi… with great difficulty. * Who is your muse? - There was a Scottish writer called Muriel Spark. She wrote many novels, thin, enigmatic kind of books. She died some years ago and I loved her books because there was a lot of religion in them which is a subject I am extremely interested in. There was a lot of enigma in them and a lot of humour. So this combination of enigma, humour and some interesting religion, it's my own concerns. So I've always loved her work. She wrote this very famous book which became a film called "The Prime of Miss Jean Brodie". For some reason she was one writer who touched my heart. * Any other favorite writers? - I've a lot of favorite writers. Nice write up. And its good to know that there are still some strong willed Indian writers who like to be original. Being born and brought-up in India, if I recollect, me reading any Indian literature would be the old legands like Mritunjay or Chandrakanta.. no other good choice/options available then. A light novel, small stories based in Indian back ground would be a nice break. For the last few years I thought the only literature written in India are the those lousy Indian TV serials. But its good to know that Ms. Namita is putting an effort and organizing a platform for India writers to connect so we can hope to see some nice work soon.